This simple recipe from world-renowned chef Marco Pierre White adds gourmet flair to any meal. Use it as a starter at your next dinner party – or enjoy it any night of the week! Bring water to a simmer in a medium saucepan. Stir in the Knorr® Homestyle Stock Chicken to melt. Melt the butter in a separate, large, heavy saucepan. Add in the onion, leek and potato and cook over a high heat for 10 minutes, stirring constantly so that the vegetables sweat (that is cook in their own juices without browning). Bring the simmering stock to the boil. Add the boiling stock to the sweated vegetables and bring to the boil. Cover and cook over a medium heat for 12 minutes. Add in the double cream and cook for 2 minutes. For a more everyday version or if you’re watching calories, use single cream or half-fat crème fraiche and heat through gently without bringing to the boil. At this point, you can sieve the soup to make it silky smooth, but you can also simply serve it as is. Using a ladle, transfer the soup to a jug blender or food processor and blitz until smooth, doing this in a few stages if needed. Pour the blitzed soup into a fine sieve over a large serving bowl and use the ladle to press the soup through the sieve; again doing this in a few stages if needed. 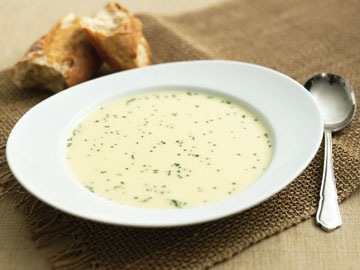 Sprinkle the chives over the soup, mix in and ladle into soup bowls to serve. For more great recipe ideas, visit knorr.ca.